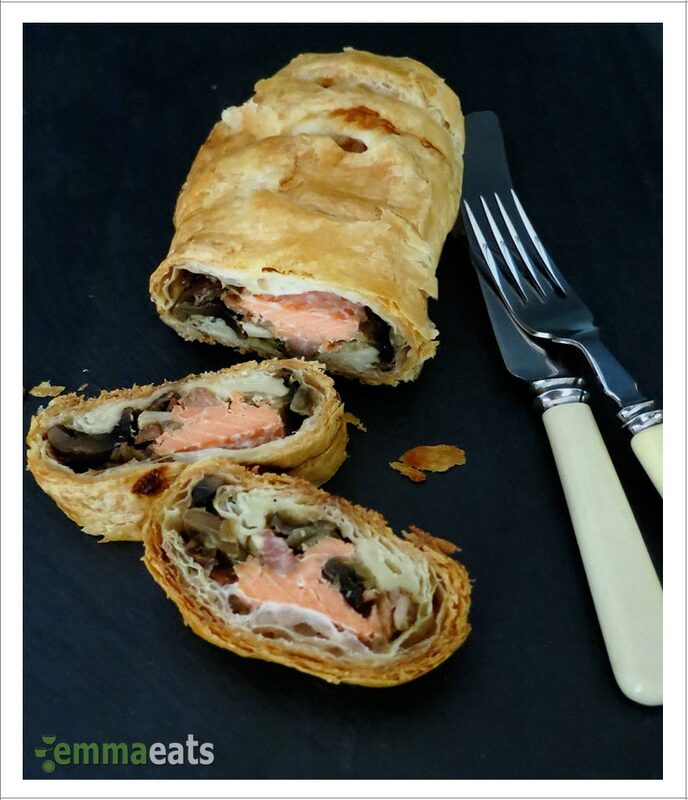 Trout Wellington | EmmaEats…and Katie too! Chocolates, sweet tarts, and cinnamon hearts. Although two members of our household wouldn’t argue about sweets on Valentine’s Day, there is someone who would prefer something less sugary. Fear not, we will have sweet treats too but alas, chocolates, sweet tarts, and cinnamon hearts do not a dinner make, even if it is for Valentine’s Day. These personal-sized Trout Wellingtons look impressive, are simple to make, and once in the oven, are effortless. If you’re having your Valentine’s Day dinner at home, that means lots of time with your Valentine(s). Time well spent indeed! In a large frying pan, heat the oil over medium heat. Add the pancetta, onions and garlic and fry until the onions have softened and the pancetta browned. Add the mushrooms and continue to fry them until they have released much of their liquid. Season with the herbes de provence and remove from heat. Set aside. Line 2 baking sheets with parchment paper and preheat the oven to 375F. On a lightly floured work surface, cut a sheet of puff pastry in half. Place a piece of trout in the centre of each half. Lightly salt and pepper the trout and crumble a tablespoon of the goat cheese over each piece. Next, take 1/4 of the mushroom mixture and spread that evenly over the cheese and trout. Fold the sides of the puff pastry towards the centre, over the trout and other fillings, to make a sealed rectangle. Place the two packages, seam side down, on to the prepared baking sheet. Repeat with the remaining ingredients and place the last two packages on to the second baking sheet. Brush the tops of the packages with the egg wash and gently cut a few slits about 1 1/2″ in length on the top of each. Bake for 30-40 minutes until the pastry is golden and fish looks opaque through the slits on the top. Serve immediately or let cool to room temperature, wrap and refrigerate. To reheat, place on to a parchment-lined baking sheet and warm in the oven. This is equally delicious with salmon as it is with trout. Try adding chopped spinach or beet greens to the onion and mushroom mixture -especially if you’re trying to include some extra veggies for the kids. These can be refrigerated and reheated with fantastic results. Hi Val! Thanks for visiting! Hope you’re doing well too and I’m looking forward to hearing about your experience with the trout — not to mention catching up otherwise too!